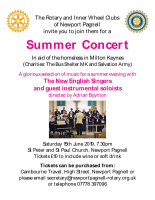 Welcome to the Rotary Club of Newport Pagnell. The pages on the website show how we have provided "Service Above Self" in Newport Pagnell since 1963. We are actively seeking new members. The UK's oldest iron bridge still open to traffic. There is no formal meal, but a variety of food can be selected from the bar/restaurant menus if ordered in time to attend the meeting; 6.45pm is recommended. Since 1963, our Club has been supporting our local and the global community through fundraising, cooperation with other organisations, and hands-on involvement, in a spirit of fun and fellowship. Short talk by scouts sponsored to attend international jamboree, plus a talk by a Rotary Global Grant Scholar. Discuss status of club projects.